South Westland and Haast are renowned for its Pounamu (greenstone) gathering, gold mining, forestry, farming, deer-hunting, white baiting, and of course the fly fishing. If your looking for a real wilderness fly fishing New Zealand experience then this is the place to do it, many rivers are accessed by foot but if you want to really get into out of the way fly fishing locations then flying in by helicopter is the way to go. Staying overnight campout style is an option on these trips to really explore the rivers and streams in this region, but not for the faint hearted as the sandflies can be fierce to say the least. 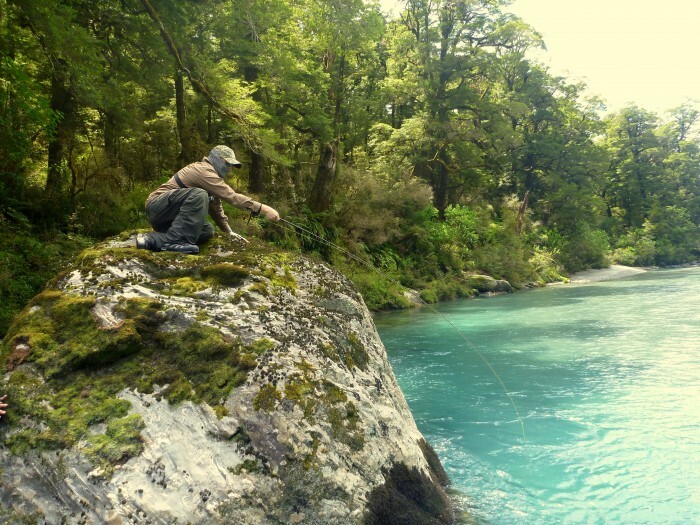 New Zealand trout fishing at it's best ! The climate is wet at times with over 3000mm of rain each year falling! Summers can be settled with long spells of hot weather, resulting in some awesome cicada fishing, at times the river valleys can be deafening with these large clumsy insects buzzing around and crash landing into the water, triggering big fish to rise to the surface and either gently sip them down or completely smash them! Contact Paul to book your New Zealand trout fishing adventure now !